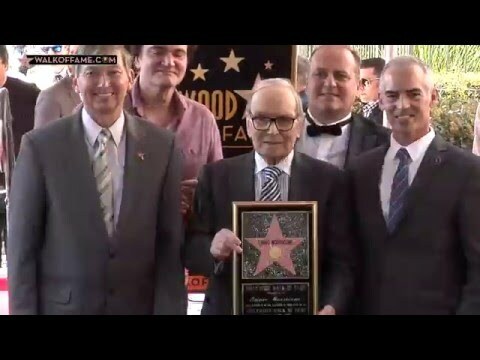 The Hollywood Chamber of Commerce proudly dedicated a new star on the Hollywood Walk of Fame for composer Ennio Morricone today, February 26, 2016 at 11:30 a.m. The star in the category of Live Performance/Theatre is located at 7065 Hollywood Boulevard. Ennio Morricone was born in Rome on November 10, 1928. His long artistic career includes a wide range of composition genres, from absolute concert music to applied music, working as orchestrator, conductor and composer for theatre, radio and cinema. In 1946, he received his trumpet diploma and in 1954 he received his diploma in Composition at the Conservatorio di Santa Cecilia under the guidance of Goffredo Petrassi. He wrote his first concert works at the end of the 1950s, then worked as arranger for RAI (the Italian broadcasting company) and RCA-Italy. He started his career as a film music composer in 1961 with the filmIl Federaledirected by Luciano Salce. World fame followed through the Sergio Leone westerns: A Fistful of Dollars(1964),For a Few Dollars More(1965),The Good, The Bad and The Ugly(1966),Once Upon a Time in The West(1968) andA Fistful of Dynamite(1971). He was recently nominated for an Oscar® for Best Original Score for The Weinstein Company filmThe Hateful Eightwhich is in contention for several Oscars®. The film recently won a 2016 Golden Globe for Best Score. In 1965, Morricone joined the improvisation group Nuova Consonanza. Since 1960, Morricone has scored over 450 films working with many Italian and international directors including Sergio Leone, Gillo Pontecorvo, Pier Paolo Pasolini, Bernardo Bertolucci, Giuliano Montaldo, Lina Wertmuller, Giuseppe Tornatore, Brian De Palma, Roman Polanski, Warren Beatty, Adrian Lyne, Oliver Stone, Margarethe Von Trotta, Henry Verneuil, Pedro Almodovar and Roland Joffè. His most famous films (other than the Italian westerns) include:The Battle of Algiers;Sacco and Vanzetti;Cinema Paradiso;The Legend of 1900,Malena;The Untouchables; Once Upon a Time in America;The MissionandU-Turn. His absolute music production includes over 100 pieces composed from 1946 to the present day. Titles includeConcertoper Orchestra n.1 (1957);Frammenti di Eros(1985);Cantata per L’Europa(1988);UT, per tromba, archi e percussioni (1991);Ombra di lontana presenza(1997);Voci dal silenzio(2002);Sicilo ed altri frammenti(2007);Vuoto d’anima piena(2008). In 2001, Morricone began a period of intense concert activity, conducting his film music and concert works for symphony orchestra and polyphonic choir in more than 100 concerts across Europe, Asia, USA, Central and South America. In the recording field, Morricone has received 27 gold discs, seven platinum discs, three Golden Plates, and the Critica discografica award for the music of the filmIl Prato. The soundtrack from the filmThe Good, The Bad and The Uglywas inducted into the Grammy Hall of Fame in 2009 while Morricone himself was awarded the prestigious Polar Music prize the following year. His more recent works include scores for the television seriesKarol and The End of a Mystery,72 MetersandFateless. In the 21st century, Morricone’s music has been reused countless times for television and in movies including Quentin Tarantino’sKill Bill(2003),Death Proof(2007),Inglourious Basterds (2009) andDjango Unchained(2012). In 2007, Morricone received the Academy Honorary Award “for his magnificent and multifaceted contributions to the art of film music”. In November 2013, he began a world tour to coincide with the 50th anniversary of his film music career and performed in locations such as the Crocus City Hall in Moscow, Santiago, Chile, Berlin, Germany (O2 World), Budapest, Hungary, and Vienna’s Stadhalle. On February 6, 2014, Riccardo Mutti conducted the Chicago Symphony Orchestra performing Morricone’sVoices from the Silence, a cantata Morricone composed in response to 9/11 to give voice to innocent victims. In autumn 2014, Morricone participated in the recording of a documentary about himself by Giuseppe Tornatore, which is yet to be released. His European tour resumed from February 2015 to March 2015, with 20 concerts in 12 countries, in Europe’s largest arenas, such as the O2 in London and the Ziggo Dome in Amsterdam. Playing to a total of 150,000 spectators and with most of the shows sold out, Maestro Morricone’sMy Life in MusicEuropean Arena Tour was a resounding success. Giuseppe Tornatore’sThe Correspondence, with an original soundtrack composition by Morricone, was released on January 15th 2016.